Before any treatment takes place, Dr. Henriod will make sure any questions you have are answered. Gum recession is the result of bone loss around the tooth. The result is a tooth that looks too long, is prone to tooth decay and may be sensitive, as tooth roots are exposed. Dr. Henriod’s minimally invasive gum graft surgery can repair the problem while helping to prevent further bone loss and gum recession. 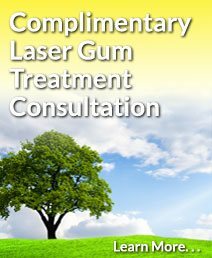 During gum graft surgery, Dr. Henriod will take gum tissue from your palate to cover the exposed root. This procedure can be performed for one tooth or many teeth to even your gum line and reduce sensitivity. You can see the patient’s gum recession in the left image. After gum grafting (right) the patient’s gums are healthy and the roots are protected. 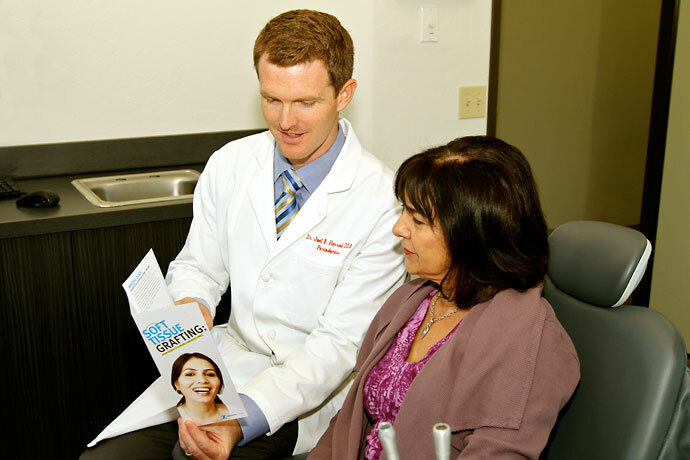 Dr. Henriod is an innovator when it comes to minimally invasive gum grafting. Minimally invasive means he uses smaller instruments and smaller incisions and sutures. This leads to faster healing, much less discomfort and better results than conventional surgery. He’s also developed specific gum grafting approaches that allow for fewer incisions than traditional methods that result in less pain, sensitivity, bleeding and downtime. Gum recession is a very serious condition that affects over half of the adult population in the United States. Whether you need a minimally-invasive gum graft to improve esthetics or function, the results are a combination of both: a confident new smile and improved periodontal health.